Caesar's Creek Pioneer Village is an open air collection of over 18 historical log cabins and other buildings from the 18th century and early 19th century. For the most part, these are not recreations, but are the actual buildings that have been donated primarily from the area around Caesar Creek. Most were disassembled, restored and repairs made so they appear as much as possible as the original structure would have looked like at the time they were first built. In the case of the Friend's Meeting House, it was moved entirely intact. The village is part of Caesar Creek State Park, located just east of Waynesville. During special events held throughout the summer and fall, the buildings are open. During the rest of the year, visitors can walk around the circular stone drive and open green. The village is maintained and operated by a private non-profit organization. Unlike today, early roads were usually developed and maintained by private citizens. To help pay for these endeavors, tolls were collected at various points along the road at toll houses. The toll house not only collected the tolls, but they also provided food and drink, plus they sometimes provided lodging for travelers. This toll house was located along the Waynesville-Wilmington Pike at the Massie-Wayne Township line. Later it was moved across Route 73 where it became a farm granary around 1900. The Hawkins House is one example of what is called a "saddlebag" house that was common in developing areas of the state. There are typically 2 cabins that share either a common wall, common roof, and usually a common fireplace. The school house in Pioneer Village was originally located near Harveysburg on Jonahs Run. Schools were an important factor in Ohio, even from the very first pioneers. These early settlers realized the long-lasting importance education would play in the development of the land and the community. Often times, when pioneers came into a new area, they would erect a small cabin as quickly as possible for immediate protection. Then once the field was cleared and planted, time would be spent building a larger, more comfortable cabin. 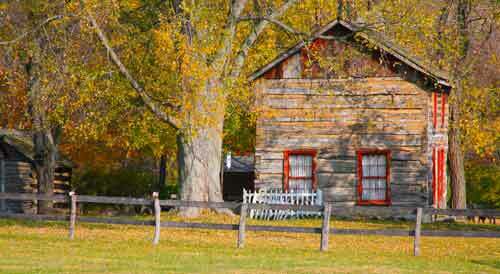 The first cabin, called a settler's cabin could then be used for other purposes, such as a school house. Early teachers were paid 60 cents a day. The above cabin is a good example of a settler's cabin. 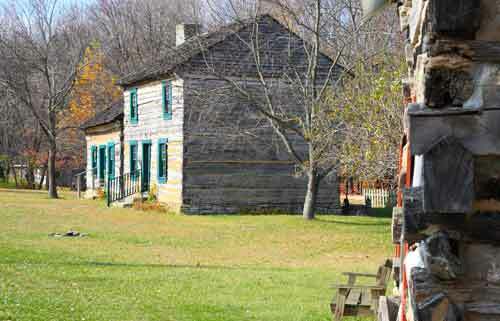 It is thought to have been built sometime between 1793 and 1795, and is the only known Ohio settlers cabin still in existence. The Friends Meeting House was the third meeting house and was built in 1849. The first cabin was built around 1805. It was located close to Caesar's Creek on New Burlington Road. The cemetery was surrounded by a very fine dry wall stone fence. The few remaining members of the meeting house wished to have the building preserved, so permission was given to move Meeting House in tack to the village.